CJ Spirits, 120 Willow Run Drive, Kane, Pennsylvania, is located along scenic Route 6, at the southern tip of the Allegheny Reservoir, and is northwestern Pennsylvania’s first craft distillery. Spirits are hand crafted using fresh local ingredients, pure “Allegheny Mountain” spring water, and state-of-the-art distillery equipment. Owners Sam Cummings and Tom Jones use time honored methods to craft the finest of spirits — Whiskey, Gin, Rum, or Rocksov, a small batch vodka made from rye grain. In the tasting area, sample the selection of spirits while enjoying homemade appetizers, soups, salads and sandwiches. Take a tour. 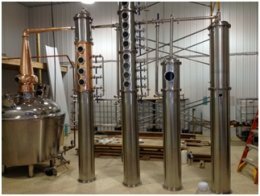 Check out the 300 gallon Artisan Hybrid still and learn the process of making spirits. Shop the retail area for home bar accessories, mixers, hats, apparel and a wide variety of gift items. Group Tours are welcome with advance reservation. Free parking is available.